Hocker’s Mill, a.k.a. Slate River Mills | slate river ramblings . . . .
Hocker’s Mill, also known as Slate River Mills, was the subject of a very brief Virginia Historical Survey written by Garnett Williams. She located the mills at 1.9 miles south of Dillwyn; however, sometimes Mrs. Williams confused her directions. The mills are actually north of Dillwyn. The original mill, owned over the years by the Hocker, Dowdy, Anderson, and LeSueur families, burned in 1905. One of the first water-turned mills in Buckingham County, Garnett wrote that it had been a very large, well-constructed building. The mill that replaced it burned in the 1940s. 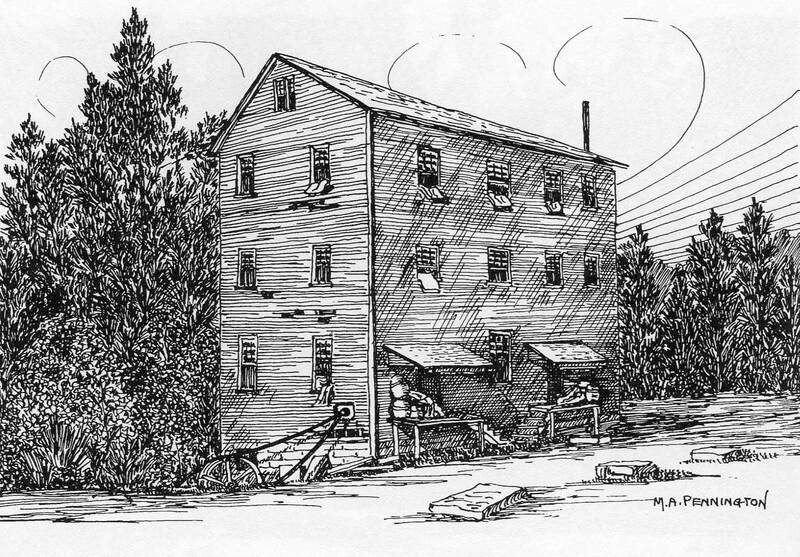 In 1860, George Hocker reported proceeds for his grist mill, where he processed 15,000 bushels of wheat (worth $18,000) and 10,000 bushels of corn (worth $10,000). He employed three men at the mill. In 1870, Hocker reported earnings from both a grist mill and a saw mill. He worked at the saw mill and had four additional men in his employment. Correction: According to an article found in the Appomattox and Buckingham Times, the mill burned in 1908. Thank you so much for your wonderful website!!! The mill was located on what is now Old Mill Road, off of Slate River Mill Road. If you are heading west on Slate River Mill Road, (north, northwest of Dillwyn), Old Mill Road is on your left before crossing over the Slate River. The foundation of the mill is still there in a small copse of trees. Here are several pictures I had taken of my great great grandparents mill in February 2007. Napoleon and Judith (née Murray) Dowdy owed the mill from 1884 to 1902 (they brought the mill from Nathaniel Archer Dowdy, his brother-in-law/3rd cousin). Napoleon passed away in 1896. Judith, a widow with 11 children, tried to run the mill with her older sons for several years. They overhauled and updated the mill in 1898. However, despite her best efforts, it became too much and she decided to sell. She relocated to Roanoke with her younger children. The first picture is 2 of 3 old silos, and the other 2 of the foundation. The mill sat on a horseshoe bend in the river. That’s too funny. Napoleon and Judith’s daughters, Irene and Rebecca Leigh, both married Woodsons (I don’t know if they were brothers). And to add to the conquincidence – Judith Murry’s mother is Almira Agee, daughter of Thomas Agee and Elizabeth Hooper Wooldridge. My great-grandmother’s older brother, Clifton H. Harris, married Cora Ann Hocker on June 16, 1897 in Buckingham Co., Va. Cora was the daughter of George William Hocker and Mary Catherine Moss. Would this be the George Hocker of Hocker’s Mill? Would love to learn more about Great Aunt Cora and her family. I have a picture of their son, Julian, with my grandfather, William Earl Duncan, as young boys. Dave, I can’t confirm that this is the same George Hocker, but it is likely the same family. Moss is a familiar name in Maysville (Buckingham Court House). Hopefully, someone who knows will see your comment. I’m only 5 years too late to reply here, but here goes. My grand parents were Cora Ann Hocker and Clifton H Harris. I have genealogy on both. Teresa, Thanks for your comment. It’s never too late to leave one. Visitors to Slate River Ramblings often use the archive to visit previous posts. Hi, cousin Theresa! Thanks so much for your reply to this post! I would love to learn more about the family of gg-grand uncle Clifton and gg-grand aunt Cora. My great-grandmother, Mary Rebecca Harris (affectionately known as Mama Dunk), was a younger sister of your grandfather, Clifton H. Harris. I have very little information on the children of Clifton and Cora. If you would be willing to share information, please email me directly at dduncan@mvnu.edu. Thanks again! I am often confused by Garnett Williams’ directions…. since this mill is north of Dillwyn. Here’s some interesting info on the Hockers. Hocker’s Mill For Sale | slate river ramblings . . . . Slate River Mills | slate river ramblings . . . .